By the early 1940s, big band music was coming into its own and, especially during the war years, the Mocambo was considered “the nightclub’s nightclub,” so the place became one of the most popular dance-till-dawn spots in town and a star-spotter’s idea of heaven. 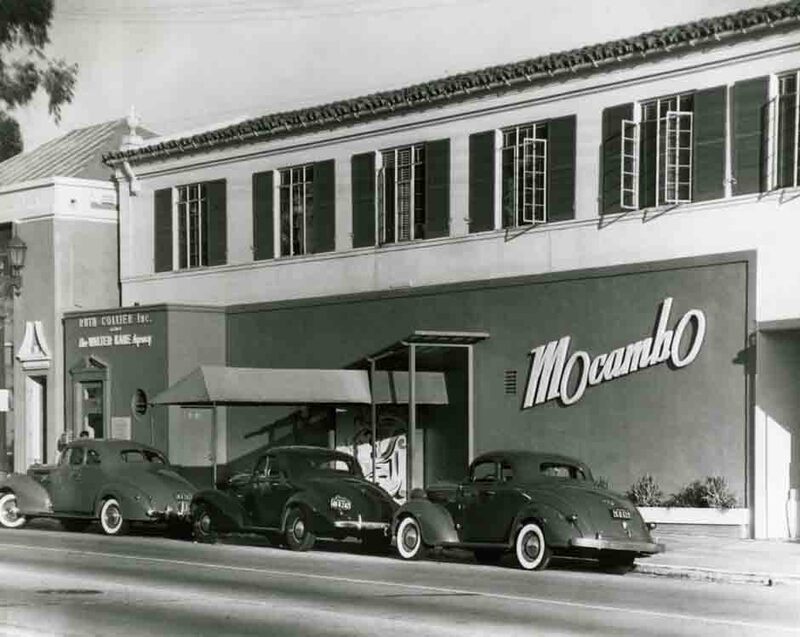 Among the many celebrities who frequented the Mocambo were Clark Gable and Carole Lombard, Errol Flynn, Charlie Chaplin, Elizabeth Taylor, Judy Garland, Henry Fonda, Lana Turner, Ava Gardner, Bob Hope, Louis B. Mayer (a dedicated social dancer with amazing dancefloor stamina), Tyrone Power, Howard Hughes, Kay Francis, Marlene Dietrich and James Cagney. 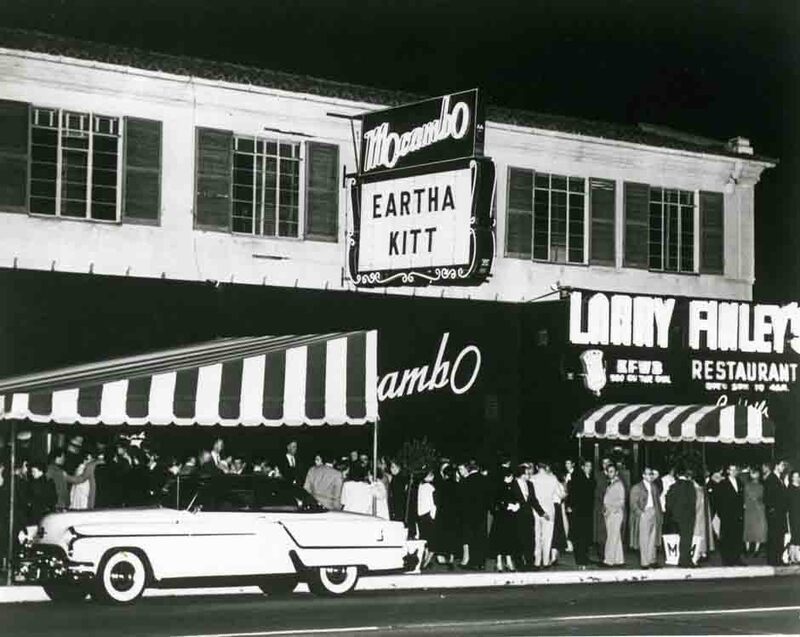 Its popularity was still going strong well into the 50s, the Mocambo was where the likes of Sophia Loren, Janet Leigh and Tony Curtis, Natalie Wood and Robert Wagner, Grace Kelly, Debbie Reynolds and Eddie Fisher, Jayne Mansfield could be seen. Myrna Loy and her husband Arthur Hornblow must have loved the place: it’s where they celebrated their divorce. It was a fave haunt of Bogie and Bacall, too. (During their early courting days, Bogie and Bacall were residents of the Garden of Allah, which stood just a little ways down the Strip to the east of the Mocamabo.) Whenever they came in, the band would strike up That Old Black Magic. In 1943, when Frank Sinatra became a solo act, he made his Los Angeles debut at the Mocambo. And later, in the mid 1950s, Ella Fitzgerald became the first black performer at the Mocambo, after Marilyn Monroe lobbied the owner for the booking. The booking was instrumental in Fitzgerald’s career, and the incident was turned into a musical in 2005, called Marilyn and Ella. For several years, the Monday night house band was a group called the Firehouse 5 Plus Two, all of whom had day gigs as animators at the Disney Studios. 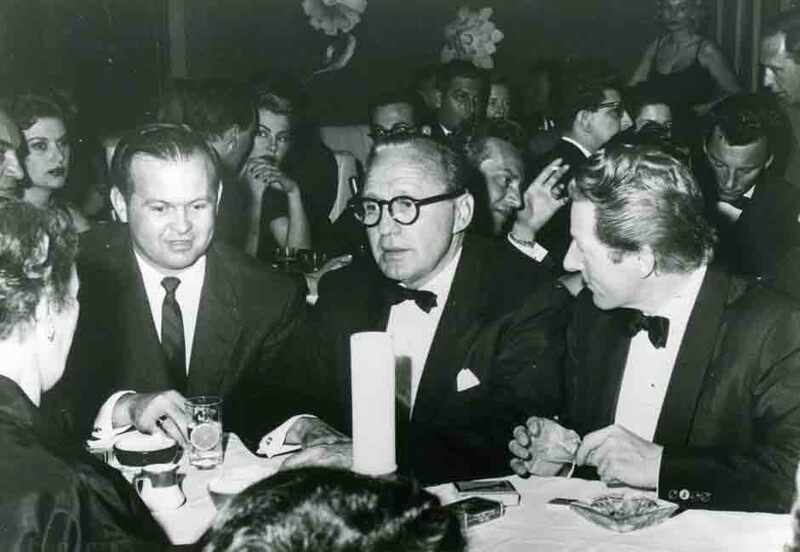 After the war, Mocambo was usurped by Ciro’s as King of the Strip, but it remained on Hollywood’s “A” list well into the next decade. It closed in 1959, and–in a repeat of so many of these former Hollywood nightclubs–a parking lot now covers the Mocambo site as well as that of its celebrated neighbors, the Trocadero and the Garden of Allah. Visit hollywoodphotos.com to view the finest collection of vintage Hollywood photographs.